It has always been the goal of Babcock Auto Care to strive for excellence - in customer service and auto repair & maintenance. We know you have many choices when it comes to deciding were to take your car, truck or SUV. We also know there are other great auto repair shops in Rochester, MN in every part of our city from Tilson's Auto Repair in Southeast/Southwest Rochester who won a Small Business of the Year award, to Joe's Auto & Tire more centrally located near downtown Rochester to a great auto repair shop right down the street from us started by a couple of technicians, Complete Auto Repair in Northwest Rochester. These three auto repair facilities along with ours offer quality service, excellent warranties and are considered some of the best in the area. So what makes Babcock Auto Care stand out among these and other repair shops in Rochester? Does Babcock Auto Care have the best mechanics? And what might make them the best mechanics? ASE certifications are a professional way mechanics or technicians (the names are interchangeable), strive to achieve excellence in this industry. At Babcock Auto Care, we pay for and encourage all of our mechanics to take these test and become proficient in all of the areas recognized. ASE even stands for Automotive Service Excellence. If our mechanics are not already certified upon hiring, we have the tools to help them succeed in achieving these as well as a shop foreman and other ASE Master Certified technicians that will help them - not only prepare for tests but become excellent, well-rounded technicians that are able to perform all services we offer including difficult diagnostics. Our team of mechanics not only have these certifications, but they are honest, hardworking and care about each other and the customers we serve. Are great mechanics the only part of Babcock Auto Care that make us stand out among other shops in Rochester? Of course not! As we have developed our great team, we have also added many benefits for our customers over the years. Many families in our area enjoy a Mayo Clinic discount. With plans for Destination Medical Center (DMC) in Rochester, Mayo Clinic and the jobs they offer and families they serve is growing by leaps and bounds. Though we understand the value of all they offer, we other understand that there are many families that do not qualify a discount like this. That is why we created our rewards program: it rewards all of our loyal customers, giving them significant discounts on future service. We offer a 3 year, 36,000 mile nationwide warranty is the best you can get in Rochester while most of our competitors have a 2 year, 24,000 mile warranty. Auto Care is proud to be a AAA Approved Auto Repair facility.Living in the harsh weather extremes in Rochester, MN, we understand the importance of vehicle maintenance and we are committed in providing the best fluids for our customer's vehicles. This is why we use Mobil oil and BG fluids - they are among the best fluids available that maintain and protect the important systems in your vehicle. We live by the 4 C's -We address the concern our customers have, find the cause, make the correction and confirm it is taken care of. We are positive - We have positive attitudes and work together to create a great place to work as well as having fun while we are doing it. We respect others - Period. We provide quality - We provide quality service, quality relationships, quality experience. We practice integrity - Integrity is a value becoming rarer in our society but one we demonstrate in all we do. We have systems in place that ensure our entire team is honest and transparent in the service they are in charge of. We work with efficiency - We understand that our customer's cars are important to them. This is why we do all we can to ensure each customer and their vehicles are taken care of as efficently as possible. Because of our efforts and our motivation to provide excellence, this is something that has not gone unnoticed. 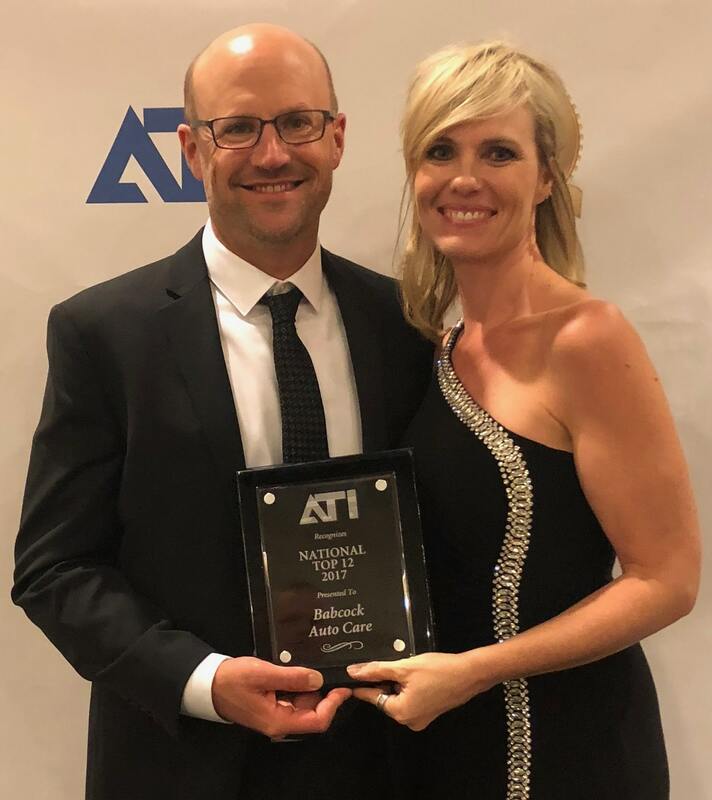 Babcock Auto Care was recognized as an industry leader by ATI in 2017 and has won many local awards for these efforts. For a list, check out our awards page.